Not considering myself a huge college basketball nor Michigan State fan, I almost didn't read and didn't expect much from the recent story on the Spartans in Sports Illustrated. Having now finished this piece by Lee Jenkins titled "The Fire Still Burns"... I'm glad I did and found it to be pretty compelling. The story is part profile on head coach Tom Izzo and his longtime ties to the area and University, but more than that, it's a look at how a team, school and championship run connected with a community. The fact that the 2009 NCAA Men's Basketball Tournament culminating in the Final Four held in Detroit's Ford Field resulted in a Spartans loss rather than win against North Carolina is almost secondary to the emotions brought out through MSU's improbable advancement to the Final and how it resonated with the city of Detroit. It's pretty common knowledge that there's been tough economic times there of late and one team's efforts on the court led by some hometown players certainly doesn't change living conditions, but in this case, it seemed to give people something to rally behind and get excited about. At the end of day, that's not a bad thing to be accomplished through sports. Also from this issue was a mention of NASCAR driver Jeremy Mayfield and his drug-testing problems with NASCAR as an organization. In short... multiple failed tests for meth, denials from Mayfield, quotes from his stepmother saying he does in fact do meth, rebuttals from Mayfield calling her a whore and saying she murdered his father. All of this combined with other Mayfield quotes about how NASCAR spiked his testing samples and is led by someone with a drug problem. Good stuff... makes me think of slightly modifying a famous quote and saying "you can take the driver out of the trailer park, but can't take the trailer park out of the driver." 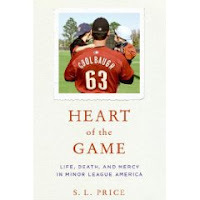 Just finished "Heart of the Game: Life, Death, and Mercy in the Minor League America" by Sports Illustrated writer S.L. Price and... geesh, that's a powerful book. I've found Price to be an excellent writer from reading his book "Far Afield: A Sportswriting Odyssey" and learned about this new work from an excerpt in an April 2009 issue of Sports Illustrated (which I wrote about in this post). While the excerpt itself is interesting in that it's about the dangers of batted or thrown balls on the baseball field, it leaves the root of the story for someone who reads the book itself. Price's work is a non-fiction narrative about long-time minor league baseball player (and subsequently minor league hitting coach) Mike Coolbaugh being killed by foul ball while coaching first base during a AA game. While the most impactful part of the book is those pages which describe the event itself, the entire story covers much more ground... and well. Coolbaugh's life and that of his wife and young children is profiled along with that of the batter, Tino Sanchez Jr., but more than that, the book is about minor league baseball. Fans of major league teams see the upper echelon of players in terms of skills, salary and achievement of dreams, but the minor leagues is different. Throughout the book, Price eloquently portrays the struggle of thousands of minor league players attempting (most unsuccessfully) to reach this major league goal. For those like Coolbaugh who briefly reach the majors, the game can be perhaps more painful when it provides a taste of success, but then takes it away with a return to the minors. So close, but just not quite there... whether due to skill level, injuries suffered or simply bad breaks. As is described through multiple stories (with Coolbaugh's of course being the most heartbreaking), the game can be a huge burden for those who play it. In short, "Heart of the Game" is a great baseball book... which works on many levels beyond the game, but at it's core, is still about the game. Labels: "Heart of the Game", book review, Mike Coolbaugh, minor league baseball, S.L. Price, Sports Illustrated, Tino Sanchez Jr. Terribly interesting cover story in the August 3 issue of Time Magazine. Titled "Inside Bush and Cheney's Final Days" it's written by Massimo Calabresi and Michael Weisskopt and details the Vice President's attempts to get a Presidential pardon for his former aide, Scooter Libby. Much more than being about this singular attempt, this Time Special Report also illuminates the relationship between Bush and Cheney and how the gears of power and relationship grind between the two men. It's also a fascinating look at how Cheney functioned in the White House along with the multitude of advisers, lawyers and Cabinet members who also provided influence on Bush. Having finished the piece yesterday, I then saw today an Associated Press report that in 2002, Cheney wanted Bush to send troops into Buffalo to arrest terror suspects... what would have been unprecedented since the Civil War and also questionable within the bounds of the Constitution. After reading something like this it just shows me that understanding history is important and makes me wonder what could have occurred had the Vice President continued to hold sway with the President through the entirety of both terms. Really good cover story from the July 27 issue of Time Magazine. Titled "Moon Walkers" it looks at the 24 men who have gone to the Moon and is written by Jeffrey Kluger, co-author of Apollo 13. It's an interesting account of America's lunar astronauts and how they were wired. One of the things that stood out from the story is how far some it was tough to appreciate and live through the normal aspects of life after such a singular experience. Reading this story reminded me of a both a Chris Jones story from Esquire titled "Why We Shouldn't End Our Manned Space Program" and his book on astronauts stranded at the International Space Station after the Columbia disaster. In paperback, it's "Out of Orbit: The Incredible True Story of Three Astronauts Who Were Hundreds of Miles Above Earth When They Lost Their Ride Home" and the seemingly more appropriate "Too Far From Home" is the hardcover title. Just fascinating stuff about some select people who have way seriously done something different than the rest of us through human history. Yea, I could see being back on Earth feeling weird after that. Just finished an interesting book on writing titled "Keep It Real: Everything You Need to Know About Researching & Writing Creative Nonfiction". It was edited by University of Pittsburgh English Professor Lee Gutkind... created as "the godfather of creative nonfiction" by Vanity Fair Magazine. While this description of Gutkind is a bit over the top, the book itself has a lot of interesting things in it for an aspiring writer (well, I guess for a writer of any kind given an aspiring writer is someone who doesn't yet know how to write). The book is an incredibly fast read with many short chapters devoted to a specific how-to area of creative nonfiction, including fact-checking, memoir writing and point of view. I found it interesting in that I like the genre (populated by writers such as Doris Kearns Goodwin, Erik Larson and Jon Krakauer) and it made me want to learn and write more. Gutkind himself is a prolific author and a list of books he's either written or edited can be found on this page of his blog. He's also the driving force behind the literary journal Creative Nonfiction, a magazine about and populated by this particular type of writing. Between some of these books and resources and the creative nonfiction classes (online and otherwise) that must be out there, there's definitely avenues to follow for someone interested to learn more and improve their writing (heck, just write) in this area. Interesting cover story from the July 20 issue of Time Magazine on soon to be former Governor of Alaska, Sarah Palin. Titled "The Outsider: Where is Sarah Palin Going Next?" the piece is written by the most excellent Time editor and writer David Von Drehle and examines Palin's decision to quit as Governor and what her future is pointing towards. There's an enormous amount of speculation about whether Palin's resignation was done with an eye towards a 2012 Presidential run, but the impression that I got the article is that her intent in quiting isn't towards what she wants to do, but rather what she doesn't want to do. Whether her future is as a Presidential candidate or simply a wealthy Conservative Republican pundit author/talk-show host/paid speaker (which is what would bring about the wealth), she appears to want to do any of that more than she does fulfill her elected term as governor of Alaska. Certainly her prerogative... whether it's the smartest move for her political future or the best for those who elected her could certainly be questioned, but the overriding impression that Palin gives about these questions is she doesn't care. She's gonna do whatever she wants to do... and of course if anyone disagrees with her, well... you know. Having finished the heartfelt "Home Game: An Accidental Guide to Fatherhood" by Michael Lewis (which I reviewed here), I decided to stay in the genre and just finished Sam Apple's "American Parent" (subtitled "My Strange and Surprising Adventures in Modern Babyland"). It was different than the Lewis book in that it lacks a lot of the sentimentality, but has some interesting facts and information. The approach Apple took was to look at the whole baby-industrial complex (a fairly descriptive term given the $s involved) on a chapter by chapter basis starting at conception and then running through early parenthood. Choosing a name, birth classes, attachment parenting, sleep training... lots of topics covered by Apple and all in a fairly humorous manner while still providing some lots of details about each area. The overriding thing that comes out of the book is that parenting can be tough, but you do the best you can for you and the kid and it'll probably all work out for good. Not a bad concept. Recently finished "Open Ice: Reflections and Confessions of a Hockey Lifer" by Jack Falla (also the author of the novel "Saved" that I reviewed here). I enjoyed it quite a bit and what really struck me about the book is the coincidence of Falla's passing from a heart attack just prior to it's release. This is even more profound as the book deals quite a bit with Falla's view of mortality in this highly personal account of his life in hockey. "A Death in Montreal": About Falla's trip on his own dime to be at the memorial service for Maurice "Rocket" Richard. A fascinating account of how Richard impacted French Canada... which compels me to recommend the movie "The Rocket" (sometimes known as "Maurice Richard". Available on Netflix, it features some excellent hockey action from this era and shows the circumstances of Richard's career and why he mattered so much. "Skating the Rideau Canal": One of the chapters that struck me in light of Falla's passing as his stated goal was to skate the canal through Ottawa while 80. Sadly, he didn't make it. "Requiem for the Cucumber": About another Falla hockey field trip of sorts... this time to the small town of Chicoutimi, Quebec to learn about local legend Georges Vezina and view his grave. Just an interesting look back in hockey history. "Searching for Hobey Baker": Chronicles a Falla trip to the New Hampshire school attended by perhaps the most famous American hockey player. The namesake for the college hockey player of the year, Baker was one of those larger than characters who died extremely young... actually, the last person to die in WWI. Similar to that on Vezina, a very cool history lesson of sorts provided in this chapter. "Goodbye to the Backyard Rink": Details Falla's experience with his backyard rink and how it has influenced the lives of he and those close to him. Another poignant section of the book as Falla wrestles with the question of whether to stop putting the rink up of his volition, or whether to wait until he's no longer healthy enough to put it up. Apart from the book, I found to be of interest a memorial Facebook group page that I found through a google search for Falla. Just seems like he was a really good guy and definitely an excellent hockey writer. Well, I guess I can say that I've now been writing this blog for a full year now. On July 5, 2008 I posted "Out of Orbit (or "Too Far From Home") & other writings by Chris Jones" and have since been on a pretty consistent 12 month string. From that time I've done about 180 different posts for an average of 15 a month or about one every other day... not too shabby. My busiest month was August 2008 in which I posted 23 times and my least prolific month was 11 which I came in at a few different times. Pretty consistently, though, I've been putting 13-16 a month out there on the worldly wide interweb supernet highway. I last did a review type look at topics covered in this March 2008 missive and since it's now been a full year... no time like the present for an update. Referencing back to the aforementioned "about 180" language, the #s below don't exactly total the number of blog posts done. Reason being is several of the posts combine together a book review and magazine article. - 31 posts: Other... includes 10 that are my personal writing ramblings and the rest from a hodgepodge of websites, television shows and other publications. I'm not going to draw any huge conclusions of what the above #s mean (in large part because I already did posit some ideas in the aforementioned and linked to March 2008 post of blog topics covered to date), but I still am happy with the content put out there. So, you know... there's that! The July 6 Time Magazine edition was it's annual "Making of America" issue and carried the cover heading "What Barack Obama Can Learn From FDR". Time's 2008 version on this theme was about Mark Twain (and linked to at this blog post) and this year's iteration had multiple pieces of interest about President Franklin D. Roosevelt and his connection to President Obama and current times. The first story was titled "FDR's Lessons for Obama" and written by historian David Kennedy. Maybe I just really like historian-authored pieces in Time like this one on the Great Depression by Niall Ferguson, but it's fascinating stuff. One of the main points that Kennedy makes is how FDR used the the bleak economic climate as an opportunity to enact programs that he felt the country needed long-term. It's an interesting concept and to me seems an example of what can occur when you have both a great leader and confluence of events makes that greatness needed. Maybe not a perfect connection, but it makes me think of the Shakespeare "12th Night" quote... "Some are born great, some achieve greatness, and some have greatness thrust upon ’em." Two other articles in this feature I found to be of interest were "The First 100 Days" about the beginning of the FDR presidency and "The Price of World Peace" about FDR's management of the US entry into WWII and subsequent dealings with Stalin's Russia. The first story to me showed how FDR deserves huge credit for taking such bold steps and being willing to risk failure. The second stood out as almost the flip side to the first in that it showed a highly pragmatic FDR making deals with Stalin that he knew not perfect, but in the best interest of all.